Good news! The Arizona Sports and Tourism Authority is still making its payments on time to pay off the Arizona Cardinals‘ stadium! Less good news: Because tourist tax revenues have been lower than expected, the authority is doing so by skimping on everything else it was supposed to be spending money on. By its own projections, the authority is facing a $34 million shortfall for those categories over the next five years. Okay, I know, boo-hoo, Maricopa County (which includes both Phoenix and Glendale, where the stadium is actually located) is having to spend less money convincing you to take a vacation in the desert. (Youth sports spending is arguably more of a loss, unless you work at a Maricopa tourism board, I suppose.) The point here is that when voters approved hikes in hotel and rental-car taxes in 2000, they were told it wasn’t going to just fund an NFL stadium — but it turns out that’s mostly what it’s done, since the stadium construction bonds are first in line for being paid off. And while the stadium authority figures out how to cut corners to make up that $7 million a year shortfall, it could soon be facing a far bigger hole, via that court ruling from last year that declared the car-rental tax to be in violation of the state constitution, since it wasn’t going to pay for anything highway-related. There’s still a year or two worth of appeals to be waited out, but if that other shoe drops, suddenly Maricopa County is going to be faced with either finding money to fill another $10 million or so in shortfall, or defaulting on the stadium bonds, neither of which is very appetizing. At least the Cardinals’ lease runs through 2036, so it’ll probably be another decade or so before the team owners start demanding a new stadium to replace the one that the county is already having trouble paying for. And at least it’s still working out better than Glendale’s deal for the Coyotes, kinda. Believe it or not, the Arizona Coyotes have found yet another way to get more subsidies out of Glendale: The city council will vote in June on whether to approve a $46 million parking garage to serve the Coyotes, the Arizona Cardinals, and the local mall. The garage bonds would be paid off by Glendale’s 235,000 residents, which on the face of it is only $20 $200 [EDIT: sorry, early-morning math] apiece (plus interest), but coming on top of a $220 million arena and $275 million in operating subsidies for the NHL team, it’s adding insult to injury, if nothing else. To be precise, the parking garage would actually still be part of the original terrible deals with the Cardinals and Coyotes, which requires the city to provide 6,000 parking spaces for the football stadium and 5,500 for the hockey arena. (The new parking deck would hold 4,000.) And it would save the city a few hundred thousand dollars a year that it’s been spending on renting spaces to meet that obligation. Still, it’s another expense that hasn’t previously been accounted for in the subsidy totals, so update your scorecards appropriately. And shake your head sadly for the poor citizens of Glendale, who are paying a record price for the presence of a hockey team that hardly any of them are actually interested in going to watch. Well, that’s different. Of course, Weiers is a different sort of mayor on the subject of sports spending: He fought to overturn the sweetheart deal that Glendale gave the Arizona Coyotes to stay in town, and Glendale won this Super Bowl before he won election, so he doesn’t have any stake in talking up the benefits. A study funded by Arizona’s Super Bowl committee found that visitors spent $218 million around the 2008 game, but some economists say the actual profits were much lower because football fans crowded out other tourists. Little of that money aids the city directly. Glendale said it spent $3.4 million in 2008, mostly on public safety, and earned only $1.2 million in taxes from direct spending at places like hotels and restaurants. (Tickets are not taxed.) One former councilwoman, Joyce Clark, who voted against hosting the 2015 game after witnessing the city’s losses seven years ago, scoffs at the idea that the publicity was worth it. “There has not been any corporation that moved to Glendale because the CEO came to the Super Bowl,” she says. 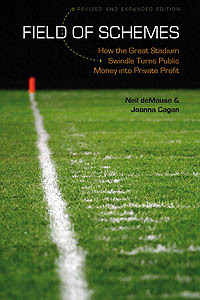 Prior independent estimates have shown that cities might be able to turn a profit of a few million dollars on a Super Bowl, even after paying for all the free police and billboards and cellphone towers and ATMs — though that’s probably more the case in a bigger city where a greater share of the money being spent stays local. (If Super Bowl attendees spend money in Phoenix, that doesn’t help Glendale one whit.) Anyway, if the public debate around this becomes a matter of whether the Super Bowl doesn’t mean squat for cities or might leave a handful of change scattered on the coffee table, that’s still a welcome step forward from where it’s been. Fink’s ruling is tied to a constitutional provision that requires the state to spend money raised from vehicle taxes on related issues like highways. “You can’t have highway-related taxes and spend it on stadiums,” [rental-car company attorney Shawn] Aiken said. The Arizona Sports and Tourism Authority relies on the car-rental tax money not just to pay off the Cardinals’ stadium, but to help fund Cactus League spring-training facilities as well. Without it, somebody would need to come up with a whole lot of cash, and quick. This is a giant mess, and if the ruling is upheld on appeal (there will absolutely be an appeal), and if there’s no way to funnel the car tax money to roads and divert other road money to the stadium authority, it’s likely to provoke one of those “What would happen if we just stopped paying the bills for that stadium?” discussion that is all the rage these days. The lawsuit’s main argument was that it violated federal interstate commerce laws by attempting to assess a tax against visitors to Arizona, while not charging the tax against local residents who happen to rent cars. Fink found that while the law meant to be discriminatory, it wasn’t discriminatory in practice. Rental companies were just assessing it against everybody. The paperwork for determining who should be assessed the tax and who shouldn’t was just too complicated for them. So what was sold to voters as a car-rental tax only on tourists that would fund sports facilities in fact may turn out to be a car-rental tax on everybody that will fund car-rental companies. I believe that’s what the kids today call a fail. The Arizona Cardinals moved their summer training camp back to the team’s regular-season home in Glendale this summer after 25 years in Flagstaff, which no doubt was gripping news to all of you Arizona Cardinals training camp fans. But since the whole move was over money — money the Cardinals didn’t want to pay in rent to Northern Arizona University, money NAU didn’t want to spend on further renovations to its facilities, and money that football advocates claimed Flagstaff would lose without the annual influx of Cardinals fans — it’s interesting to see how the city fared with summer football gone. Sales tax revenues from restaurants and bars for July and August were up by 5.3 percent over the same two months in 2012, according to city data. For August alone, when much of the camp was held, restaurant and bar spending was up 11.6 percent even without the Cardinals. Spending in hotels and motels also was up, although many Cardinals fans from the Valley are day-trippers. Lodging tax collections increased 7.7 percent in July and August, and 7.3 percent in August alone. Taken together, August revenues from the 2 percent BBB tax were up 9.9 percent compared with August last year. “This tells me that the Cardinals training camp has some entertainment value for Flagstaff but is not as significant an economic driver as we perhaps thought it was,” said Mayor Jerry Nabours. Now, it’s hard to tell from these numbers alone whether the Cardinals leaving truly had no impact — local sales tax revenues have been up almost every summer since 2007, as the city has been marketing itself as a cooler summer destination for Arizona residents, so it’s possible the numbers would have been even better with the Cardinals. Still, it’s a pretty significant sign that losing visiting sports fans needn’t mean disaster for a local economy: If Cardinals tourists are being replaced by Grand Canyon tourists who don’t have to worry about fighting with football fans for hotel rooms and restaurant reservations, all the better — especially since the Grand Canyon doesn’t demand new locker rooms.